More and more I find my sketchbook a constant companion. At the very least, I keep a small sketchbook and pencil or pen in my bag and every free moment I pull it out. Instead of mindlessly scrolling through FaceBook, I open my book and draw. Even if I am not inspired by my surroundings, I still make notes and write down ideas or thumbnail sketches for things I want to study. This practice has made me a better artist and much more productive with my time! How are you doing with your creative practice these days? Is it consistent and strong? Sporadic and spotty? Or stuck and not happening? Well, no matter where you are at in the creative process, now is the perfect time to give yourself a creative tune up and inject some fresh inspiration into your practice. I am so pleased to have been asked to be one of 23 instructors who will be sharing their sketching techniques and practices to the world! And guess what? It's completely FREE! It’s easy to join. You won’t have to travel anywhere, book any tickets or rearrange your schedule. You’ll be able to fit the workshop into your regular life and enjoy the sessions from the comfort of your own home. Not only that, but it’s completely free. In other words, you can reap the benefits of attending the workshop without spending a cent. Not only that, you will also receive many free gifts from the various artists teaching, including one from me! So come on over to this vibrant community and see what we are up to! Click on the button below to have instant access to the world in your sketchbook. I hope to see you there! I woke on that first day in Mexico to the smell of TORTILLAS! 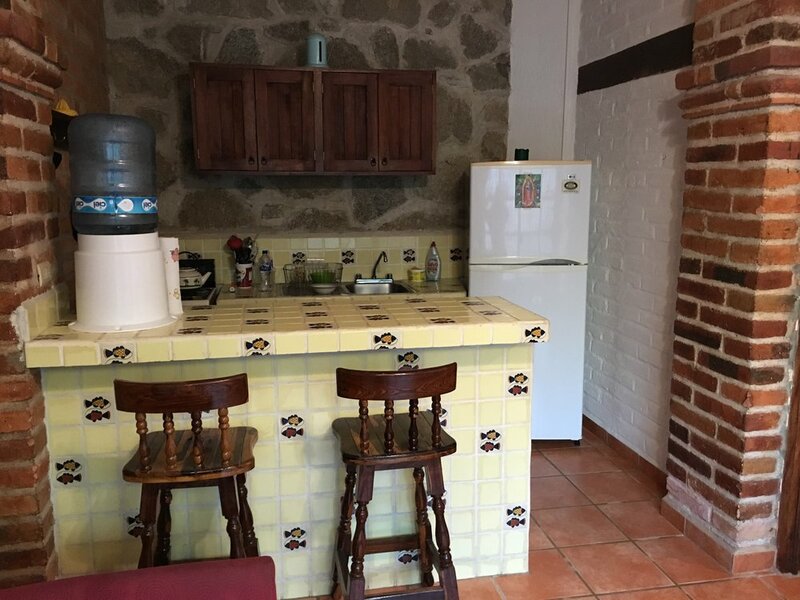 Remember, I told you my casita was right next to the Tortilla factory. My senses were bombarded at 6am with a pungent mixture of frying oil and salt air. I quickly got ready and gathered my art bag and decided to walk through the village instead of crossing the frigid river water! After my epiphany the night before, I embraced the little village and delighted in everything around me. "Buenas Dias," people greeted me as I walked along. "Hola." 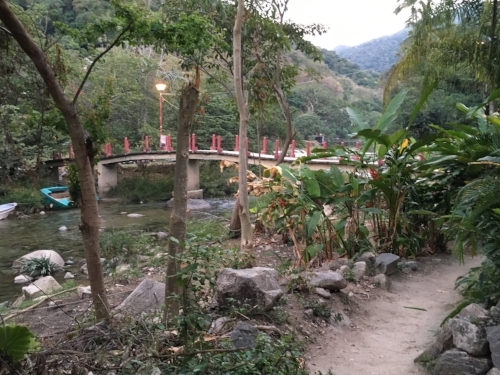 I made my way up the dusty road and found my way to the bridge that crossed Rio Horcones. The poverty in this village was evident only to me. I could sense that the locals were rich with the gift of simplicity. They had all they needed and it was more than enough. My paranoia from the day before was gone - I was no longer the "gringa," but simply a welcome visitor in their neighborhood. Crossing the river by bridge, I discovered a whole different face to the Village. Sweet little children in pristine uniforms and backpacks were skipping off to school. They too had to cross the bridge to follow a jungle path up to their school on the side of the mountain. In the States, you wouldn't consider letting your child walk by themselves down a city street, let alone in the jungle! But this was a community of friends and families that took care of each other and they had no reason to fear anything. It was like stepping back through time. Arriving at the Casa de los Artistas, I enjoyed a lovely breakfast with fellow artists. After our dinner last night, we were no longer strangers, but friends about to embark on an adventure together. I was excited and started feeling some peace in my soul in this beautiful setting. The chatter of people mixed with the squawking birds and animals of the jungle reached a crescendo and it felt surreal as coffee was poured and juevos were placed in front of me. After breakfast, we moved upstairs to the open-air studio - it took my breath away. I couldn't imagine any place better to try to reignite my creative spirit. I settled into my "spot" for the week and couldn't wait to start! I freshened up a bit to go over to the Casa de los Artistas for the meet and greet. I was so worried about getting to my casita that I never stopped to notice my surroundings. It wasn't until I opened the front door to leave that I looked out of the casita to an incredible view that stopped me in my tracks. Across the dusty road I traveled to get to my new home was a lovely beach, outdoor restaurant/bar, and the mouth of the river where it meets the Ocean! I was so self-absorbed when I came in that I never noticed my casita was ocean front. Since it was nearly sunset, I decided it would be quicker to "cross the river" than walk back through town and cross the river further up and make my way down the other side through the jungle. Plus I will admit, I was a chicken to walk through the jungle by myself. I crossed the narrow stretch of beach to the shallow river and slipped off my sandals and rolled up my pants legs. I could see the Casa de los Artistas on the other side and this was literally a 5 minute trek. I gingerly stepped into the water that was ICE COLD and picked my way across the rocky bottom. The current was STRONG and in the center the water got deep! My pants got wet, and I made a mental note to cross a little further away from the mouth next time. It must have been a hilarious site to the other artists already gathered on the balcony above. I entered the Casa and made my way upstairs to meet my "tribe" for the coming week. I always dread those first awkward moments when you enter a room and don't know anyone but since we were all in that same position, small talk was a little easier. After a few cocktails, conversation relaxed and we began to get to know each other. We made our way back onto the beach for a simple, yet delicious meal of fresh red snapper. 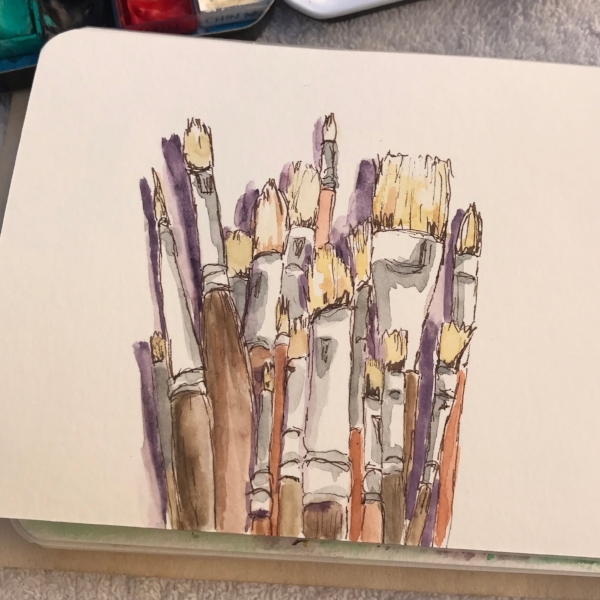 Getting to know my fellow artists, I quickly discovered I was with a diverse group of artists - they were all very cool and interesting to learn about. Halfway through the meal, a local guy came up to me at the table and offered me a big fat JOINT. I nearly died as I fumbled over my words, "I, uh, I, um, don't really do that." "Oh, senorita," he cooed, "come on, it's a gift for you!" I immediately imagined DEA agents bursting in on the scene as I quickly contemplated my decision NOT to take the weed. Another woman in my group said, "well if she doesn't want it, I'll take it!" I soon found out that most of the group were from places where pot was legalized and they gave me an quick lesson about everything from medicinal marijuana to cannabis oil to pot gummies. I kept thinking to myself that I had stepped back into the 70's as I looked around the eclectic group discussing their various "dealers" and blends that they partake in. I felt like the uptight soccer mom from Suburbia. Is this real life? After the meal and entertaining conversation, I made my way back to the Casita. All was very quiet in the little village and I bolted myself in and settled in bed. Thankfully the windows had heavy bars because it was a warm night and I had to open them up to get some cool air. About the time I started to close my eyes, I heard a car pull up with the radio blasting. More and more cars arrived and I peaked out the window to see a large group gathering on the road and the beach in front of the casita. It was nearly midnight and a band was setting up. I could smell food cooking and hear the laughter and sounds of a party just kicking off. Exhausted and emotional, the tears rolled down my face as I contemplated my life and felt I was living some altered reality. And as despair was setting in, I began to quiet myself and pray. Between my low sobs, I heard the sounds of a mariachi band. The Cumbia music drifted through my open window and it occured to me that this was beautiful. The sounds of the horns and guitars strumming mixed with strong, harmonized voices. This was Mexico. This was what I had come for. To immerse myself in another culture and run as far away from my normal, boring, sad life as I could. As the waves and music blended together, moonlight splashed across my bed and I drifted off into a deep and peaceful sleep . . . Upon arriving in Boca de Tomatlan, our vans pulled up to a folding table on a dusty, dirty road at the bottom of a hill. There stood a woman with a safari-type hat, water shoes and a clipboard. It was such a random and almost comical sight as young boys appeared seemingly out of nowhere and began unloading suitcases. There was chaos and instructions being called out in broken spanish/english as the woman was trying hard to look at labels on bags and assign spaces. - I was trying to wrap my head around the whole scene. She was clearly going to organize us but the pieces weren't fitting together in my mind. Why weren't we pulling up to the Casa de los Artistas and could these young boys be our bellmen? Some bags were being loaded into a fishing boat and some were being lugged by boys in all directions. It was LOCO! I tried so hard to keep my eye on my own suitcase but lost track of it quickly. When the dust finally settled, I was the lone person standing awaiting my room assignment. It was at this point, I discovered that the woman was an "intern" and it was only her second week. I signed up for the retreat a little late to get a room at the Casa, so I was supposed to be in a "sister" house. I really didn't know what to expect or how far away I would be from the group. She explained that my apartment was on the "other side of the river" from The Casa and she gave me a map and directions to where I was staying and gestured me on my way. "Meet us at the Casa at 6pm for cocktails," she called after me. "You can either cross the river to get there, or walk the long way through the jungle - just follow the map!" So off I went down the calle (road) in the direction she pointed, and urgently called my daughter..
"What have I done?" I cried to my daughter on the crackling phone connection as I stood alone on a dusty road in a tiny, remote fishing village in Mexico. Protectively clutching my purse and trying to roll my carry-on suitcase over the ruts and cobblestones with my cell phone wedged between my ear and shoulder, she said, "Mom, what did you expect? You're in a third-world country!" Click. The phone went dead and I looked around as I silently FREAKED out. I made it down the road and after a few minutes, I found my casita which happened to be right next to the Tortilla Factory. I shoved open the heavy iron gate out front and found my door, just as the intern described. A charming elderly gentleman appeared - his name was Jose and he proudly announced that he was the landlord. After unlocking numerous locks on the barred doors, Jose took me into the casita and showed me around. Much to my relief and surprise, it was sparse but very clean. It was actually pretty adorable. A tiny front room with a mini kitchen led into a bedroom and private bath. All the basics and no frills, but that was all I needed. After 5 minutes of feeling very sorry for myself, I got up and went to wash my face. And that's when I saw it . . . on the little fridge in the kitchen was a picture of Our Lady of Guadalupe. I was overwhelmed with strength and peace - sort of a "snap out of it" moment - and I knew I was going to push through and stay the week. I surrendered . . . knowing Our Lady would help me through!